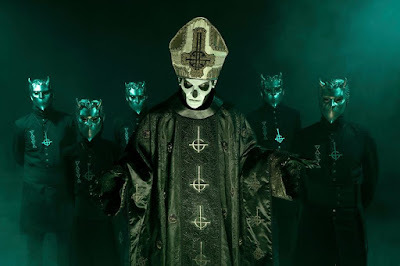 Ghost performed their single, “Cirice”, on The Late Show With Stephen Colbert on CBS-TV on October 30.
in support of the project, which delivered Ghost their first-ever US Top 10 when the album debuted on the Billboard 200 at No. 8 with opening week sales of 29,000 copies. Ghost’s third album, “Meliora” was produced by Klas Åhlund and mixed by Andy Wallace. The project sees the debut of vocalist Papa Emeritus III alongside the Nameless Ghouls.